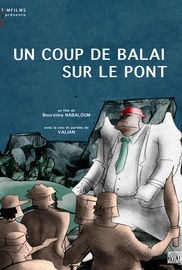 Fable based on a notorious political event in Burkina Faso in 2014. 15 selections in festivals all over the world. The inhabitants of a poor bloc, separated by a river from the rest of the city, unite to build a bridge which would allow them to access to the benefits of the city center. A leader imposes himself through a bunch of promises. As the construction is moving on, the Leader is getting bigger and bigger blocking the way. A new battle must begin. The people against the dictatorship, in the search of the democracy.